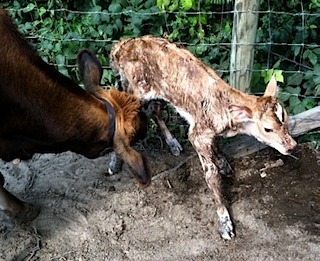 MEET STAR OUR HALF-GUERNSEY HEIFER CALF! Star is our half-Guernsey heifer! 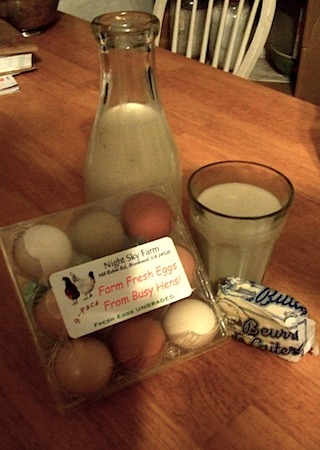 Night Sky Farm offers a Cow and Goat Share Program allowing members access to raw milk from the farm. There are up to 35 gallons divided between cow and goat milk available for shareholders at this time. One herd share equals one gallon of raw milk per week. If more than one gallon is needed, you would need to purchase the appropriate number of shares. 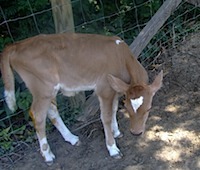 The farm has Jersey cow milk and goat milk available. Night Sky Farm is a Grade A dairy, so you can be assured that the milk is of the highest quality having to meet the strict Grade A standards each month. If you are interested in a herd share, please send me an email and I will be happy to discuss setting a up a herd share to fit your needs. It is illegal to for anyone to sell raw milk in the Commonwealth of Virginia. Each state makes up it’s own guidelines and the Commonwealth of Virginia has chosen to follow the FDA regulations regarding the sale of raw milk and raw milk products. 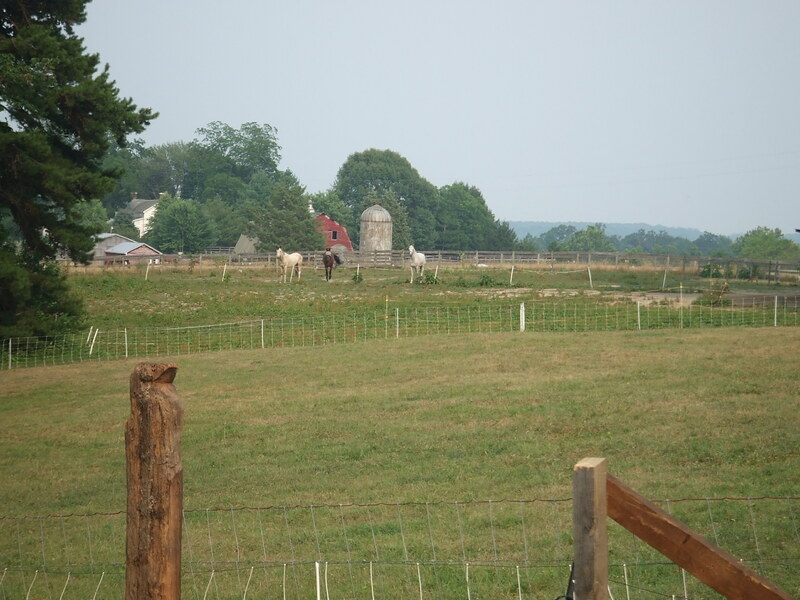 A Share Program is legal in the Commonwealth of Virginia, there are no regulations regarding the consumption of raw milk from an animal that the individual owns or owns a stake in. 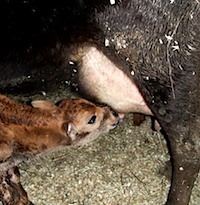 http://www.westonaprice.org and http://www.realmilk.com are two websites with valuable information about the benefits of drinking raw milk and the availability of raw milk by individual state. Night Sky Farm is a Grade A regulated dairy and cheese room. All animals are tested for brucellosis and TB yearly by a licensed veterinarian. Our bulk tank milk is tested monthly by the Commonwealth for somatic cell, drugs, water and bacteria. We meet the strict Grade A requirements each month and are also subject to closer scrutiny to maintain our Grade A status. Copies of our lab tests for our milk and our cheeses are available to view on request. We use no hormones and treat our animals with antibiotics only if necessary and then the milk is with held from the bulk tank the appropriate length of time to ensure that there is no residual in the milk. Our milk is guaranteed fresh when it leaves the farm, but it is up to the shareholder to keep the milk at the optimum temperature of 40 degrees or bacteria can grow. In a share agreement, shareholders pay a fee for maintenance of the dairy herd (cow or goat herd), for caring for the animals, milking the animals and handling the milk from the cows/goats. The shareholder then obtains (but does not purchase) the milk from either the goat herd or the cow herd. Night Sky Farm will not be held liable under any circumstances should an individual become ill. Consumption of raw milk shall be done at your own risk. Night Sky Farm charges an initial fee of $50 to purchase a share. The share is a one-time only purchase per each contract and is non-refundable. This contract, except the share purchase, is renewed every 6 months and only at renewal is the maintenance fee is permitted to be recalculated to reflect any increase or decrease in monthly costs. You, as a member own a share of a cow or a goat in the dairy herd and that interest when it concerns your milk encompasses the time the cow/goat is dry, delivery not possible due to weather, illness of the cow/goat etc. Night Sky Farm charges monthly care fee of $28.00 per cow herd share and $36.00 per goat herd share. 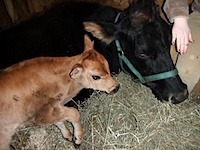 The monthly fee includes charges for feed, housing, veterinary care and dairy services. For the herd share care fee, the shareholder is entitled to a weekly (1) gallon of cow/goat milk. In addition, the shareholder is required to purchase a minimum of 6 half gallon wide mouth jars with the single white plastic lid. I can assist you in locating these if you have difficulty. The share fee is due whether a shareholder receives their weekly gallon or not. For example, the shareholder decides to take a 2 week vacation and does not want their milk. The cow still has to be milked, fed and taken care of while the shareholder is vacationing, so the care fee still has to be paid. The shareholder's milk can be frozen if desired. Need ing multiple gallons per week translates to multiple cow or goat herd shares. MILK RECEIVED FROM A HERD SHARE CANNOT BE SOLD. If the shareholder would like some fresh eggs, cheese, butter or even goat milk soap; product can be substituted, with advance notice, dollar for dollar the amount of milk they want swapped. For example, one half gallon of goat milk is $4.50 so it will interchange with a 3.2 oz tube of chevre of choice, a quarter pound of Feta in Brine, 4 ozs. 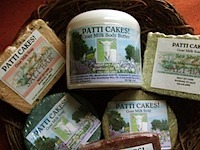 of 100% Jersey Cow Butter, a dozen Fresh Eggs or even a bar of PATTI CAKES! 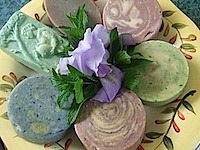 Goat Milk Soap! A Price LIst of Night Sky Farm products is available. Delivery of milk is possible, but not guaranteed for an added charge per delivery determined by location. Locations include Lynchburg area (weekday), South Boston area (weekday) and the Richmond area (Saturdays assured during the summer and fall because we attend Farmer's Markets there) We have shares available now.